Merica Labz is a spanking new supplement brand aiming at the designer pre workout space. With distinct branding based on the American flag colors and product names that are already getting some attention (is it Trump’s first attempt to make America Swole Again??). The first two products are a combo of a Stim & Non Stim Pre-Workout. 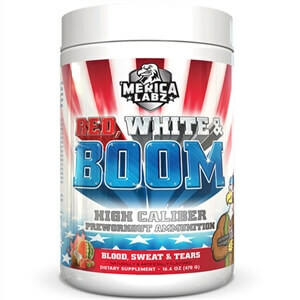 In this review, we will take a deeper look into the stim loaded Red White & Boom pre workout and see if it is indeed Boom Worthy. Starting with 25 scoops per tub and 18.7g of powder per serving of which 1.6g are active ingredients which is a great start to a label with over 90% of the powder being put to good use and very little goes to fillers and artificial flavoring. Synthetic DMHA - 150mg Synephrine HCI - 50mg Whoa...400mg is probably a bit too much for most of us. With 250 mg to 300 mg being where the effectiveness of caffeine will start to have negative effect on most people (jitter & crash). DMHA is a Psychoactive central nervous system stimulant which boosts cognitive function, decrease appetite and increases dopamine which will increase your mood. 100mg seems to be the effective dosage for the synthetic version of DMHA (which is the one we have in the Red White & Boom). So again with 150mg, this formula is overdosed on a per serving basis. Synephrine is usually found in fat burners due to its thermogenic properties. Again at 50mg this is towards the upper end of the range. Carnosyn Beta Alanine - 3.2g With a full 5g of Creatine combined with the clinical dosages of the patented form of beta alanine, you’ve got yourself a perfect combo for muscle endurance and strength. 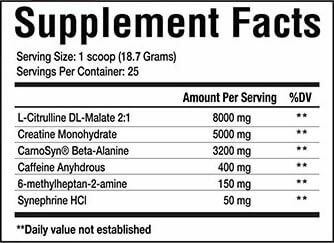 Pump L-Citrulline Malate (2:1) - 8g L-Citrulline a precursor to Arginine and is effective in increasing muscle pumps , reducing muscular soreness and most important delivering micronutrients to the working muscle. At 8 grams this is one of the highest dosages we’ve seen and well above the clinical dosage. The Label’s Bottom Line- With only 6 active ingredients this is a simple label. Generally, we are missing here mental focus ingredients like Choline or Tyrosine. Another thing to keep in mind is that with such an overdose on stims & pumps, there are two ways to look at this label. Version 1 – a way overdosed formula per serving. Version 2 – look at ¾ of a scoop as one serving and be happy with 34 servings instead of 25. Taste & Mixability – Red White & Boom comes in 2 flavors at the time of launch – Blood Sweat & Tears (berry/coconut) and Freedom (frozen lemonade). Well, AMERICA! 18g of actives means that you’ll need to shake your shaker…with that said while you’ll see some froth on the top, the mixability is great. Taste wise, both flavors deliver a great taste which is very impressive with so little in flavoring. Effectiveness – Man, this is one hell of a strong pre-workout supplement. Even on ¾ of a serving the Merica Labz hits you very hard and fast. Clean energy. As expected though there’s no real noticeable effect on mental focus and the only other down side we saw was that on a full serving size we did ‘crash’ 70 min into the workout. So I would say that this one is best optimized for shorter workouts. Though most of the readers will need to play with the serving size to find the right balance (and not overdose on stims). Merica Labz is off to a good start. Good branding, unique naming and very smart marketing tactics combined with a very strong formula that delivers. Red White & Boom felt good. Real good. If you see it on a deal on our site, we suggest you give it a shot. Or at least a BOOM! Fresh Deals Hunted Daily! See the latest Pre-Workout Deals from around the web!